Honesty and hard work. 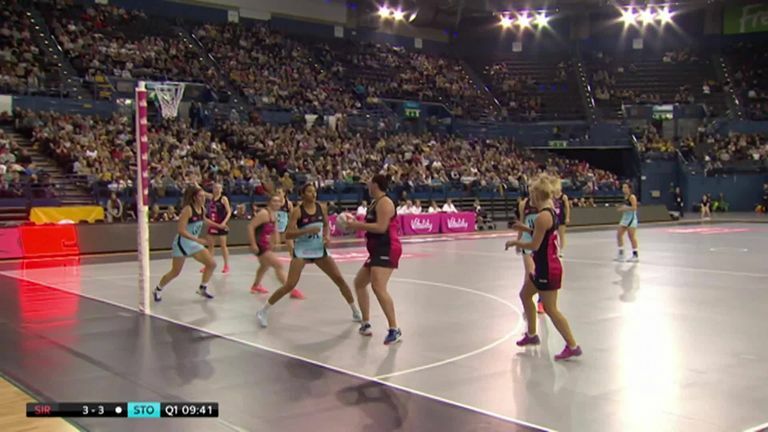 The two principles that Surrey Storm's director of netball Mikki Austin lives by, and the two principles that she told her team-mates they would get from her when it was announced that she would be at the helm for the forthcoming Vitality Netball Superleague season. The 25-year-old signed for Storm as a player from Mavericks back in 2015 and quickly established herself within the set-up, enjoying back-to-back championship titles in 2015 and 2016. Now, she's combining both playing and running the franchise. The opportunity to lead a Superleague franchise arrived earlier than expected for Austin, who had it set as a 10-year goal when she joined Storm, and despite successive losses in the opening two rounds, the new director of netball isn't daunted by the challenge ahead. "I've said to the players that we're under no illusions about how much of a tricky time this will be," Austin told Sky Sports. "Two years ago, after we came off the back of winning two championships, we went through a mass exodus of players and coaching staff, and we then spoke about a rebuild, and that never really happened." Mid-court player Austin was an integral part of those high-flying days, and remained after the exodus. Now, her focus is fixed firmly on Storm's future, and not about dwelling on their past. "So I guess I'm taking the reins now, and we are actually now going through that rebuild, which is why we've included so much youth and NPL players into our roster this year," explained Austin. "This isn't a quick fix - this is a long-term process, and for a year or two years, it's going to be really challenging. I need players and staff that are willing to be really mentally resilient to that, because we have to keep trusting that if we're doing the right things it will pay off. But that is a process." Storm's process continues on Monday with a visit to Team Bath Arena, live on Sky Sports, to face off against a side that has boosted its own playing resources with experience rather than youth. It's a fixture that's likely to present a considerable challenge for any side in the league, and for Austin, Monday evening is all about building on their last performance and seeing her players taking to court with a fearless attitude. "These girls, regardless of their age or their experience, understand that I trust them implicitly, and it's up to them to go out there and do what they do best," said Austin. Of course, the director of netball will not be leaving her players alone out there; instead, she'll be at the heart of proceedings in the mid-court as well. Juggling playing and being the director of netball is a balancing act that few others have had to manage, and it's one that relies heavily on Austin's principles and her relationships with her assistant coaches. "I've been really straightforward with the girls ever since it was time for player negotiations back in August when I took over this job," said Austin. "They might not like it, but you understand why we're doing what we're doing and what positions we're in. And I will always be grafting with them because, first and foremost, I'm still a player. After a thrilling Netball Quad Series, our focus shifts to the domestic stage as the Vitality Netball Superleague returns for Round 3. "As soon as I put a bib on, I am one of the team and a player… my coaches will tell me if I'm not good enough just as much as anybody else." Austin's personal goal to be a director of a franchise was achieved ahead of her anticipated timing; however, that's not causing her to lose sleep, nor has the response from the netball world been a negative one. As with players, age shouldn't be a restriction on your ability to do something. "I guess maybe when I first took this job, there was a point made about me being the youngest person to be in a director of netball position so far," shared Austin. "Certainly not to me has anyone voiced that into a negative or a positive, really. As with players, age shouldn't be a restriction on your ability to do something. "You've been entrusted with a player contract regardless of your age, and if you get the opportunity to play, then show us what you can do - and I guess me in this position should be no different." Austin's move into franchise management is sure to be a challenge. However, it's abundantly clear from speaking to her that she's more than ready to show the Superleague her hand - this season and well beyond.